Ducati unveiled their most sophisticated production superbike to date set to race the FIM Superstock 1000cc Cup in 2012. 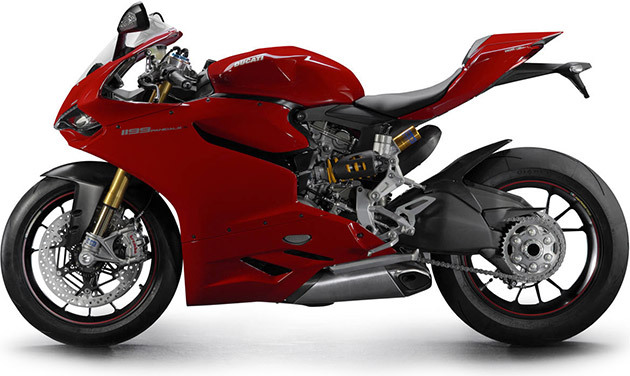 Featuring a V-Twin Superquadro 1200cc engine, the 1199 Panigale ($18,000-28,000) cranks out 195 horsepower and 98.1 lb-ft of torque to propel this 361 pound machine to well past break-neck speed. Along with the most powerful twin-cylinder engine in production, the 1199 Panigale also offers high-end electronic rider aids which includes the Ducati Riding Mode which oversees functions of the ABS, traction control , electronic suspension, quick-shift, Ride-by-Wire throttle system, and most importantly, Ducati’s race-derived Engine Brake Control designed to improve stability when decelerating or heavy braking.